Select Credits: New York Theatre: Ivy Theatre Company – Mill Fire (Marlene), Black Ice (Polly), Like Poetry (Mom), The Perfect Wife (Sarah), Incongruence (Ensemble); The Secret Theatre – A Midsummer Night’s Dream (Helena), The Taming of the Shrew (Katherine), The Tempest (Ariel), et.al. ; The Chain Theatre, WorkShop Theater Company, and many more! Why theater? : One of my favorite parts of creating a character is experiencing their emotions as you see their story unfold. I love how in live theatre both the actors and audience go through the whole journey together. Feeling the energy of the audience during a live theatre experience is an incredible rush! Tell us about Reach: Reach is set in New Orleans in 2006. It is one year after Hurricane Katrina, and Leila has stayed in the city during the aftermath of the storm. Her old friend Jordan makes a surprise visit to check in on her, and sparks fly…you’ll have to come to see what happens from there! What is it like being a part of Reach? : Being involved in Reach has been a very rewarding experience. Ryan Sprague (playwright) has given us a fantastic story and rich characters to works with, so each rehearsal is both a challenge and a joy! Our director, Andrew Block, has really pushed us to take the piece to the next level and Christopher Lee (Jordan) is an amazing scene partner who I am thrilled to work with every day. Both Andrew and Chris lived in New Orleans and have helped me so much with understanding what it was like in the city after Katrina, and we’re really enjoying playing with these characters and this story. What kind of theater speaks to you? What or who inspires you as an artist? : I am really inspired by my friends who continue to produce shows in NYC even through all of the challenges. It is a difficult process to get a show up and running (financially, artistically, organizationally) and the companies who have been around for many years are incredibly inspirational. In my time with WorkShop Theater, The Secret Theatre, and The Chain Theatre, I continue to be impressed by the dedication and hard work of the individuals who give incredible amounts of time and energy to collaboration! If you could work with anyone you’ve yet to work with, who would it be? : I would love to work with the team at LCT3. They've been doing some really interesting shows and their focus to produce work by new artists aligns with Ivy's mission of telling the stories of underrepresented voices. Who would play you in a movie about yourself and what would it be called? : I think my story is still "untitled", but if "future me" were a character, I'd want Diane Keaton to play her. If you could go back in time and see any play or musical you missed, what would it be? : I would go back and see the original cast of Rent on Broadway...I listened to that soundtrack over and over in high school and it captured my imagination about New York. When I saw the national tour in Des Moines, it was one of my first huge theatrical experiences and I fell in love with the show! What show have you recommended to your friends? : Fun Home - I took my mom to see it when she was visiting NYC, and we absolutely loved it! It is an incredibly moving and unexpected show. What’s your biggest guilty pleasure? : maybe that I still watch cheesy shows on ABC Family? That and eating massive quantities of nachos, but I don't usually feel too guilty about that. What’s up next? 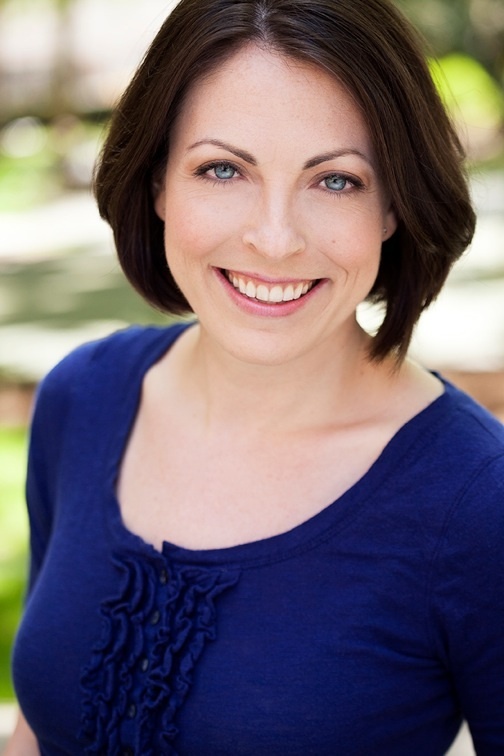 : I’ve been auditioning for a bunch of commercials…and hoping to book some of those soon! Really just looking forward to the holiday season and being able to go home to Iowa to see my family.